Disney Jr is a leading TV channel aimed at children ages 2-10 years. Doc McStuffin’s is one of the newest but most popular programs on-air and is about a 6 year old girl named Doc who communicates with and heals toys out of her backyard clinic. The series helps children to take care of themselves and others. Bring Doc to life in a retail environment to raise the profile of season 2 and create an uplift in merchandise sales. Kids love to role play – to create an engaging experience we need to give kids the chance to imitate what they have been watching on TV. A Doc McStuffin’s check up clinic. Kids were invited to come down and take the role of Doc and help to diagnose and treat ‘Big Teds’ ouchie symptoms. 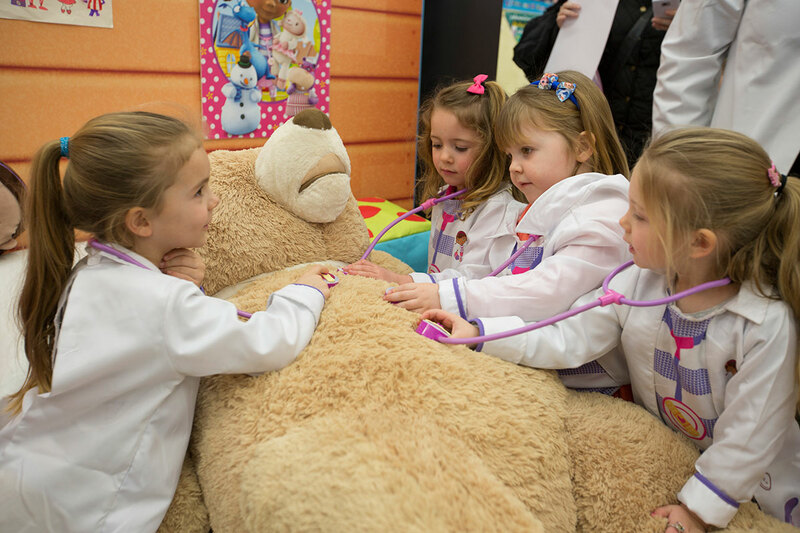 The check up clinic travelled nationwide to over 20 towns and visited 3 core retailers – Tesco’s, Smyths and Toys R Us – giving kids a 10 minute immersive experience. Every clinic has a waiting room and ours was full of fun and colour! Little Doc’s in waiting were allocated time to play with Doc merchandise, receive free colouring in and puzzle sheets and take part in stretch and flex entertainment. We provided a TV zone for children to sit back on comfy bean bag seating to watch clips and music videos from the Doc TV show. The Doc’s were trained to give Big Ted a full check up, diagnosing and treating his many ouchie symptoms. When they all passed their check up exam they received their very own Doc McStuffins certificate and ‘Doc Is In The House’ door hanger. Queue entertainment consisted of balloon animal making and iPads loaded with Doc McStuffins game apps. Money off coupons were distributed at relevant stores. People travelled from all over the country to come and experience the check up clinic.